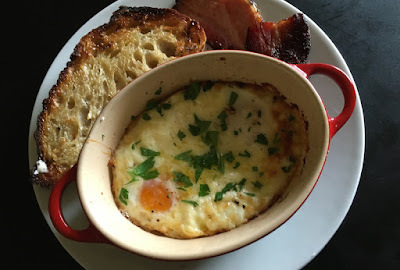 It was on a trip to Ashland umpteen years ago that I first had baked eggs. We'd booked a room at the Chanticleer Inn, a charming bungalow near downtown and the Shakespeare Festival grounds. The night before was a performance of one of the Bard's plays—not the one where some inventive but misguided director thought it would be totally cool if a lunar module descended from the rafters in the middle of the performance—and we'd walked back to the inn in the moonlight, the next morning rising to have coffee and breakfast in the quaint dining room. 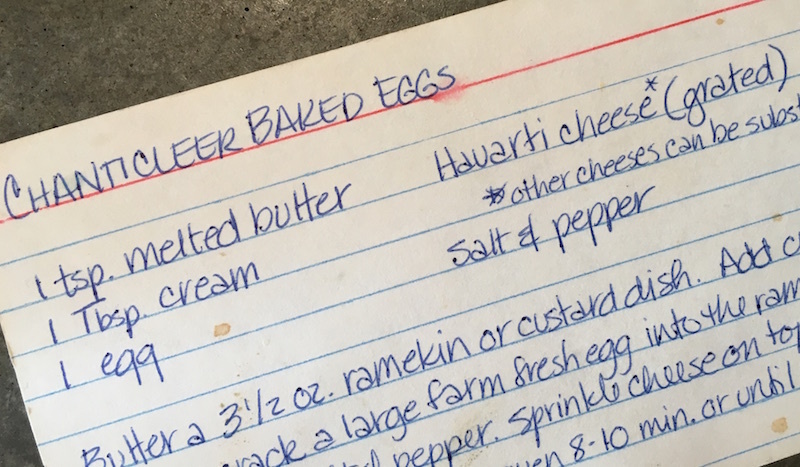 Remember recipes on index cards? Now, a dish can burrow its way into your brain for lots of reasons—a romantic setting, great company, a few too many mimosas—but this one was alluring because of its simplicity. Just butter, eggs, cream and cheese baked to a golden finish, crispy yet creamy, the yolks still oozing. I'd begged the recipe from the innkeepers and we'd made them often in the years since, but it had been a long time since we'd pulled the stained, yellowed card out of the recipe box. Fortunately Dave was in the mood for making something besides his (perfect) version of Julia Child's cheese omelet, and I was so glad he was. This is one memory that's stood the test of time, and one we'll be enjoying for another umpteen years. Great for brunch for a crowd (baked in individual ramekins) or just for one, the recipe below is the original from the inn (photo above), but we make two eggs for each person, keeping all the other quantities the same. You can also add green onions, sautéed greens or chopped, cooked bacon before putting in the eggs, or just keep it simple. 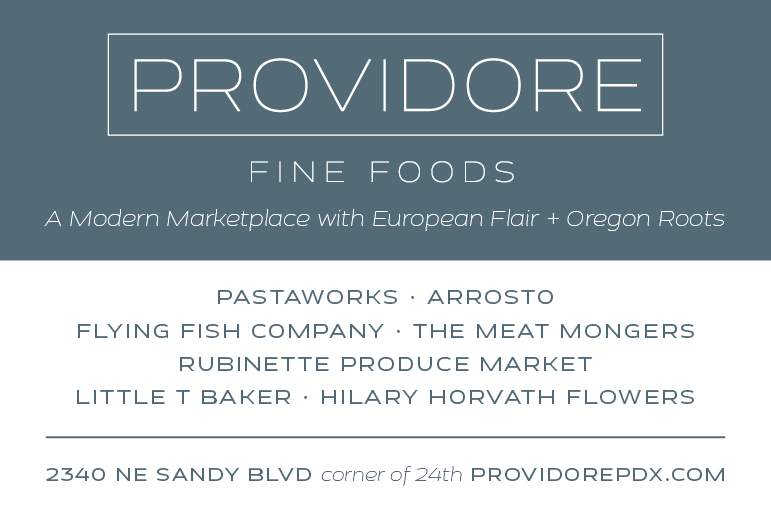 Come to think of it, this would be great for lunch or dinner, too. Butter a 3 1/2-oz. ramekin or custard dish. Add cream. Gently crack a large, farm fresh egg [we use two] into the ramekin. Season with salt and pepper. Sprinkle cheese on top. Bake in pre-heated 425° oven for 8-10 minutes or until white is firm and center still wiggles.